Donald Trump's wife gave birth to a boy Monday, the billionaire developer announced. "Everyone's perfect," Trump said in a telephone interview on MSNBC's "Imus in the Morning," about 20 minutes after the arrival of his fifth child. The 59-year-old Trump said the new baby is already making him feel younger. "I continue to stay young, right? I produce children, I stay young," he said. CNN's Larry King said Monday night that the baby's name is Barron William Trump. Melania Knauss Trump, 35, was in labor for eight hours with her first child. She went into labor after talk show host Regis Philbin left Donald Trump after spending Sunday night in Florida together. Philbin lamented being the last to know his buddy "The Trumpster," as he calls him, had a new baby. He was shocked when his producer broke the news on "Live With Regis and Kelly," so he promptly got Trump on the phone during his show. "She gave me a nice son," Trump told Regis. When Philbin heard Trump hadn't decided on a name yet, he suggested Regis. Trump told him "that's not a bad suggestion." The tycoon's first wife, Ivana Trump, is the mother of Donald Jr., Ivanka and Eric, who are all in their 20s. Preteen Tiffany is the daughter of Trump's second wife, Marla Maples. 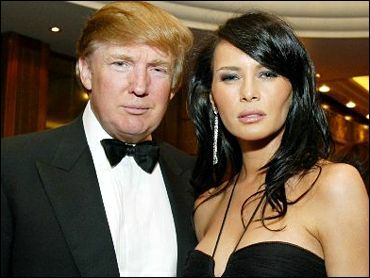 Knauss Trump is a model and commercial actress who lived with the billionaire for three years before they were married in Palm Beach, Fla. in January 2005. The setting for their opulent reception was Trump's $42 million Versailles-inspired ballroom at his Mar-a-Lago estate and club. The New York Post, which first reported the news about the pregnancy, said the mother-to-be planned to spend time recuperating at Mar-a-Lago after giving birth. The Slovenian-born model has appeared in numerous print ads and graced the covers of Vogue and British GQ magazines. Trump's reality show "The Apprentice," is in its fifth cycle.